For years, it’s been a dream of mine to travel to Seattle and visit the old haunts of some of my favorite musicians. 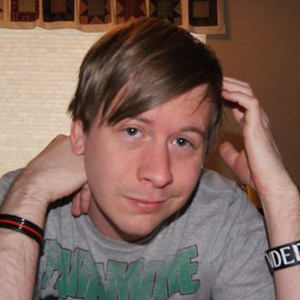 Like so many others my age, I was deeply impacted by the alt rock explosion in the early 90s – a movement that would forever alter not only the underground music scene, but pop culture itself and the philosophical trajectory of an entire generation. It’s safe to say that It’s All Dead wouldn’t exist without this movement and the local sounds that sparked it. As anyone that’s spent more than 10 minutes with me can attest, Kurt Cobain is easily my favorite musician. I’ve read nearly every book written about him, spent countless hours reading, obsessing and writing about the impact and arc of alternative rock, and argued relentlessly for In Utero’s superiority to Nevermind. However, for all of this self-proclaimed head knowledge, I had yet to step foot in the city that spawned it or walk down the roads that told its stories. This mission was recently (and belatedly) accomplished, thanks in large part to Stalking Seattle, the city’s surprisingly one and only rock and roll tour. In the early afternoon, we climbed into the back of a black minivan with a few fellow music lovers and a kind-hearted, sharp-witted tour guide named Charity. She immediately strikes you as someone who is friends with everyone. This likely isn’t far from the truth, as her knowledge of the Seattle rock scene is one born from having lived in it and amongst it. Charity is a Seattle native who started the tour a few years ago after repeated urges from those around her to fill the city’s glaring tourist void. She’s fully equipped for the task, with enough charisma to match her vast knowledge and experiences. Throughout the afternoon, Charity shares stories of laughter, tears, joy, amazement and solemn reflection of over a decade’s worth of proceedings. She and her friends literally watched the small community around them explode into a worldwide phenomenon, finding themselves at ground zero. Even years later, you can still catch a flicker of awe in her voice as she marvels at the events. Among the many stops along the way are sites such as the apartment of deceased Mother Love Bone singer Andrew Wood, the building where members of what would become Pearl Jam first heard Eddie Vedder sing their songs, venues where Nirvana first played in front of a crowd, settings for the seminal Cameron Crowe film, Singles, the sculpture that inspired Chris Cornell to write Soundgarden’s smash song “Black Hole Sun”, and the high school of Jimi Hendrix. Each stop includes a story told from Charity’s perspective, along with local lore and details to fill in the gaps. Even more intriguing is the speculation and questions that linger in the aftermath of so many of these events and settings. Herein lies the most fascinating and disturbing reality about Seattle’s celebrated music scene. Just above the sparkling reflection of artistic talent and bold culture-shifting influence lies a dark cloud of grief. Moments I had long anticipated as being filled with joy and wonder were often full of sober reflection. Andy Wood’s heroine overdose, Kurt Cobain’s suicide, Jimi Hendrix’s mysterious death, Chris Cornell’s crippling substance abuse problems, and the tragic murder of Gits singer Mia Zapata are just a few of the events that cast a dark shadow over the city’s streets that, to this day, are still plagued by heroin use. Be not mistaken, there is beauty here, but it came at a cost. In no moment is this more apparent than while standing outside of the home formerly owned by Cobain and Courtney Love, located in the ritziest neighborhood in Seattle. During their time there, the house is described as being nearly dilapidated, with peeling wallpaper and water leaking in from the roof. Outside the home, now completely restored, lies a small park with a single wooden bench, which has become a shrine for Cobain. It’s covered with song lyrics and pictures, and on this afternoon, is dressed with an old sweater and a few wilting flowers. As each of us approaches the bench for a picture, Charity quips, “Don’t smile, but don’t look too sad.” We all chuckle at the notion, finding it difficult to find the appropriate response for the moment. It is truly one filled with a deep sadness and a healthy reverence. 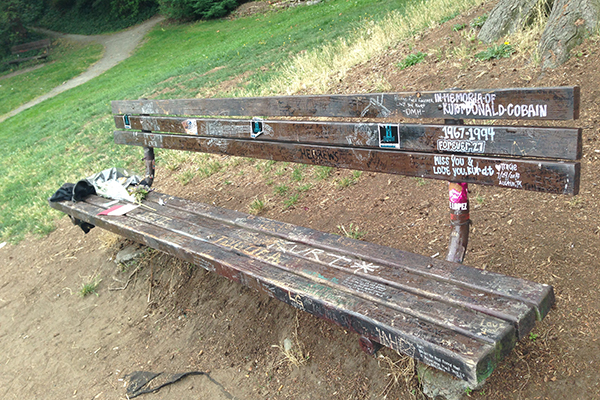 In so many ways, that lone bench embodies not only the life and lasting impact of Cobain, but of an entire generation of the city’s music and culture. Unique, yet hauntingly out of place. Inviting, yet starkly alone. 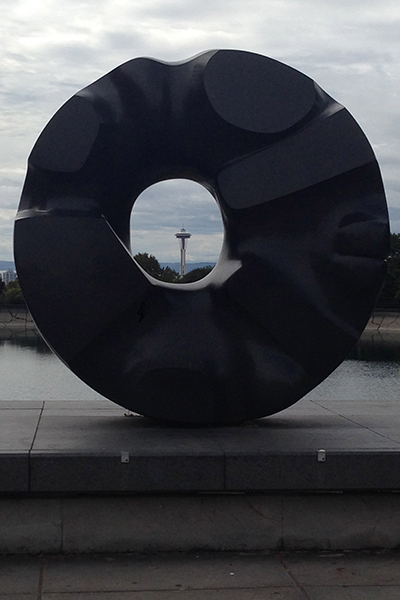 My experience of Seattle wasn’t as I expected, but was instead profoundly more impactful. Walking these paths and listening to these stories is humbling in the most unexpected of ways. We find ourselves forever grateful for the music and voices that impacted our lives so deeply, while simultaneously learning from and feeling a deep sting from the events that came in their wake. Visiting Seattle soon? 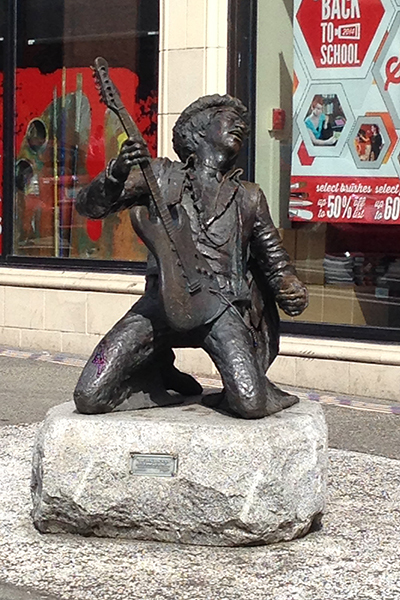 Be sure to check out Seattle’s premier rock and roll sightseeing tour – Stalking Seattle.